The investiture of Dr. Kathryn A. Foster is a historic moment for the college. In the 164 years since our founding as the New Jersey State Normal School, the Garden State’s first public college, TCNJ has only had a handful of presidents. They have led us from humble beginnings, helping us grow and adapt to changing times, while underscoring what has become the college’s hallmark commitment: an education that’s both exceptional and personal. Today, as The College of New Jersey inaugurates its 16th president, it is one of the nation’s top public colleges. Despite the challenges facing higher education in the United States, TCNJ is positioned to build on its tradition of excellence. 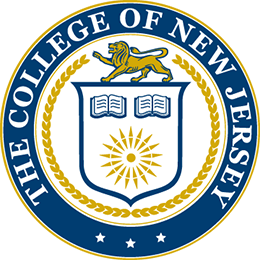 We look to the future with optimism that The College of New Jersey will, with the leadership of our new president, continue to serve as an exemplar of public higher education. Media outlets are encouraged to cover the Inauguration events. Resources, including photos, videos, and transcripts from the day will be posted as they become available. Tickets aren’t required for the ceremony, but seating in the Rec Center is based on availability. Please arrive early. A simulcast of the inauguration will also be carried live in Mayo Concert Hall. All are welcome. Resources, including photos, videos, and transcripts from the day will be posted as they become available. The robing of delegates and those in the platform party will begin at approximately 1:30pm in the Social Sciences Building. The procession will begin at 2pm with parties walking to the Recreation Center from the Social Sciences Building. The ceremony will follow in the Recreation Center. Following the ceremony the celebration will continue at a reception in Brower Student Center and on Green Lawn starting at 3pm. A press riser and mult box will be available to media in the Recreation Center for the ceremony. The event will be simulcast on TCNJ’s website, TCNJ.edu. Media are permitted to use any clips or footage from the webcast. Media parking is available in LOT 12. This event is being planned by an inaugural committee, as charged by the TCNJ Board of Trustees. 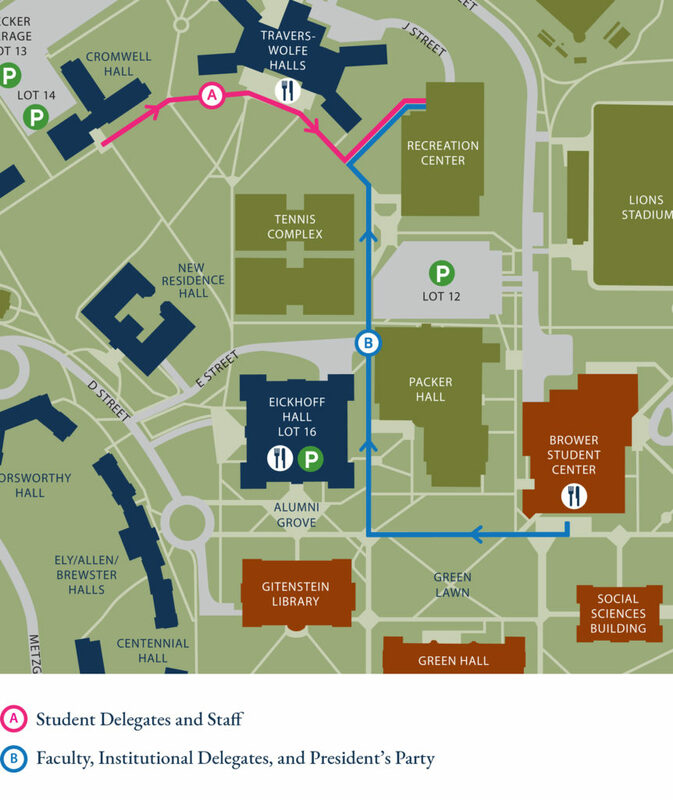 The procession will begin at 2 p.m. and follow two routes—one for student delegates and staff, the other for faculty, institutional delegates, and the president’s party. Use the map below to find your ideal viewing location! The Recreation Center is accessible for wheelchairs. Anyone needing sightline to the sign language interpreter should contact Conference and Event Services at 609.771.2361 for accessible seating reservations. Only vehicles bearing state-issued handicapped license plates and/or window placards will be permitted to park in the designated special needs parking areas. Vehicles without handicapped plates will be permitted to drop off aged or disabled guests/passengers at Trenton Hall Circle (see map), where your party can be escorted to the ceremony via golf cart. The Ceremony will have a sign language interpreter. Reserved seating with a sight line to the interpreter can be arranged by contacting Conference and Event Services at 609.771.2361. Campus Police will direct guests to designated parking areas. 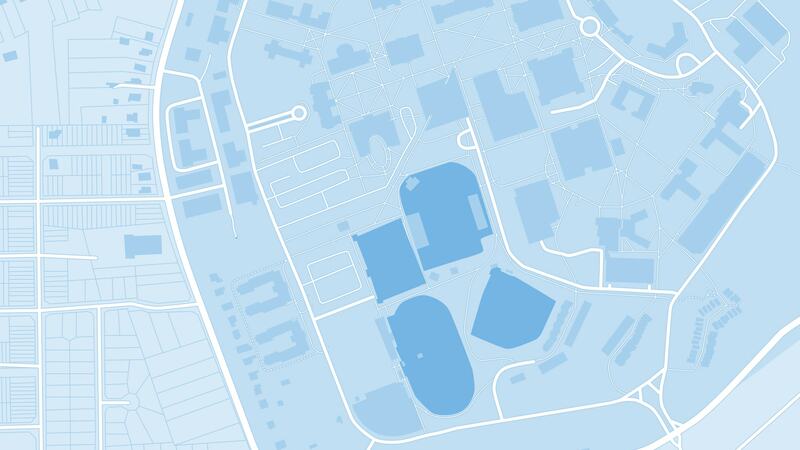 Mobility-impaired guests may be dropped off at Trenton Hall Circle. Golf carts are available to transport guests to desired campus locations. Dr. Kathryn A. (Kate) Foster became the 16th president of The College of New Jersey in 2018. A native of New Jersey and a scholar-educator with over thirty-five years of experience in public higher education, Foster comes to TCNJ from the University of Maine at Farmington where she served as president from 2012 to 2018. Prior to the presidency, she was a Visiting Fellow at the Brookings Institution, on research leave from the State University of New York at Buffalo, her academic home from 1993 to 2012. Foster earned her B.A. in geography from The Johns Hopkins University, her M.C.P. (city planning) from the University of California, Berkeley, and her Ph.D. in public and international affairs from Princeton University. Under Foster’s leadership, UMF turned around a five-year decline in enrollment, bolstered experiential education, and aligned programming and investment through the university strategic plan, campus master plan, recruitment and retention plan, advancement plan, and marketing plan. With renewed attention to campus facilities, UMF refurbished its gymnasium, created a student learning commons, improved classroom spaces and lounges, upgraded residence halls, and built a biomass heat plant, which, together with geothermal wells, significantly reduced campus dependency on fossil fuels. At the State University of New York, Foster was Director of the University at Buffalo Regional Institute, an award-winning research and policy unit informing regional issues with focus on the binational Buffalo-Niagara region, and Associate Director and Co-PI for the MacArthur Foundation Research Network on Building Resilient Regions. 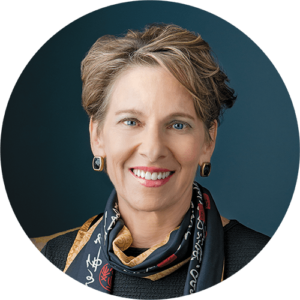 Prior to 2005, Foster served as Chair of the University at Buffalo Department of Urban and Regional Planning, where as a faculty member she taught graduate, undergraduate, and honors courses in regions, planning, economics, and governance. Foster is the author of The Political Economy of Special-Purpose Government (1997), Regionalism on Purpose (2001), and dozens of book chapters, articles, and policy reports. She participated actively on several New York State task forces, including the New York State Commission on Local Government Efficiency and Competitiveness, and was selected by Business First in 2007 as its Woman of Influence in Public Policy. Earlier in her career, Foster was a lecturer at Cal Poly, San Luis Obispo, served as a Peace Corps Volunteer in Swaziland, and, in 2000-2001, as Visiting Fellow at the Taubman Center for State and Local Government at Harvard University. Foster enjoys golf, hiking, photography, maps, road trips, theater, gardening, writing, travel, bicycle riding, interior decorating, visiting state capitols, and attending cultural events of all kinds.